I only heard about Sheepland a couple of weeks or so ago. 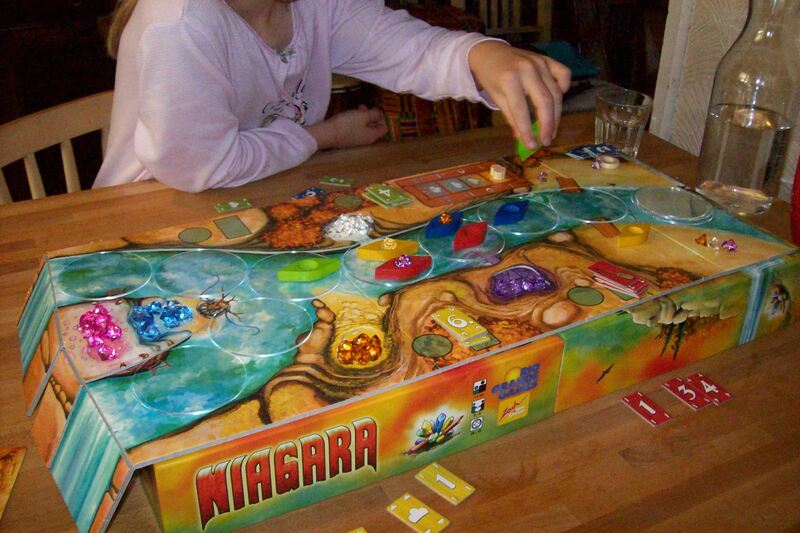 It looked cute, so I checked out some reviews and had a look at the rulebook. Simple rules, what looked like the need for a bit of thinking, plus (and this was the clincher) sheeples! (Sheep meeples, right?) So I had an opportunity to pick up a copy at TringCon over the weekend and did so. The black sheep ambles its random way down from the mountains. Basically the game starts with a bunch of sheep distributed evenly around a map and you move shepherds around to build fences and manoeuvre sheep into fields of a terrain type that you favour, until you score points by counting up the terrain tiles that you have collected during play (and the one you had to start with) and the sheep in the different terrains to get your final score. Oh, and one of the sheep, the wilful black sheep, wanders randomly around the board. We set up the game and off we went. 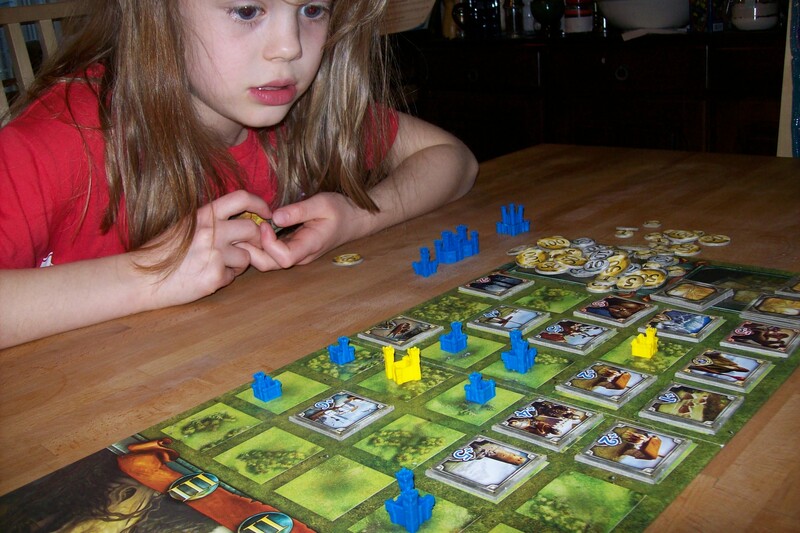 Miss B had a little difficulty with the rule that in a two-player game you have two shepherds each but you are only allowed to use one of them on each turn. Maybe we shouldn’t have bothered with that restriction, but lately we have been almost always been playing with “proper” rules unless they massively complicate things. We got about two thirds of the way through when Miss B announced that she was fed up and didn’t want to carry on. So we called off the game and had a chat about this. What Miss B told me was essentially that she had problems with the theme: if you were a shepherd, surely you would go into the fields to round up the sheep and not just walk up and down on the roads. She has a point here, though in other games we have played similar thematic issues have not proven to be a problem. I suspect this may have been her trying to express a general dissatisfaction with the game and reaching for the first explanation that made sense to her. Either way, though, this is the most surprising failure we have had yet. For what it’s worth, though, I quite like Sheepland. I’m planning to take it into work as it could be a good little lunchtime game. 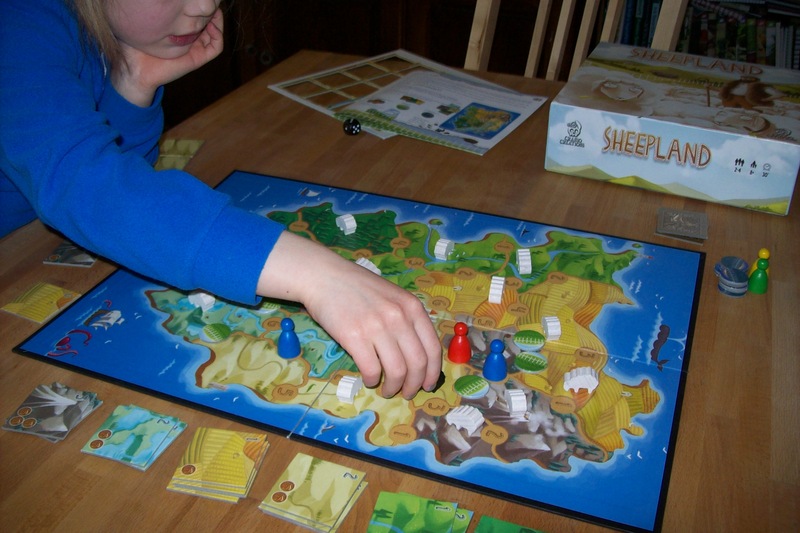 The game: Sheepland (Cranio Creations), 2 to 4 players, aged 8+. 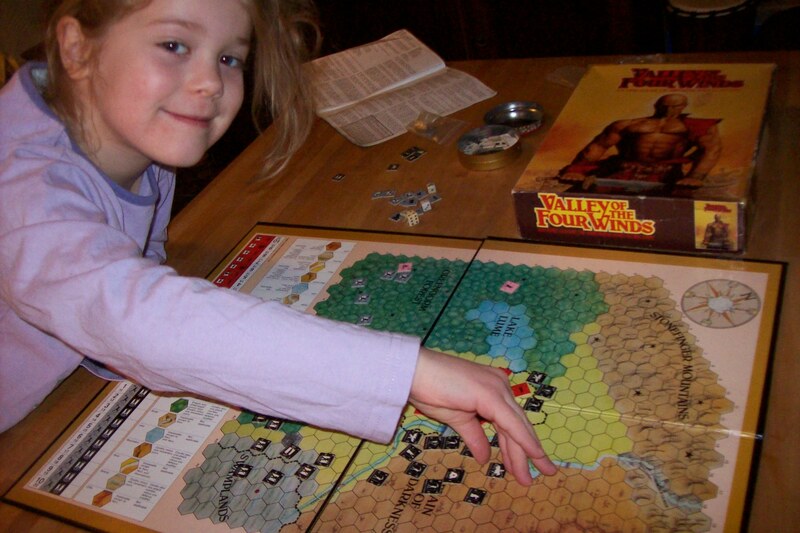 I got hold of Valley of the Four Winds when I was at school and I think it was probably my first hex-and-counter wargame. It’s a pretty solid game and has quite a nice, epic fantasy feel, with the forces of good battling against seemingly insurmountable odds, trying to hold out long enough to recruit key allies and collect plot coupons enabling them to strike back. But how would Miss B fare? Our previous exploits in games even slightly wargamey didn’t go particularly well, but her competitive spirit and tactical abilities have been coming on quite impressively of late. She’s been eyeing up a few wargames on the shelf lately and finally managed to persuade me to get one out. It was either this or Gulf Strike. Miss B ended up playing the evil side, which means control of hordes of undead, swamp lord warriors and forest orcs, and the least said about her dice rolling in this game the better. The game isn’t as long as many wargames, but in this case it took a little over an hour before the King of Farrondil ended up taking his own life rather than witness the undead hordes rolling through his beloved city. 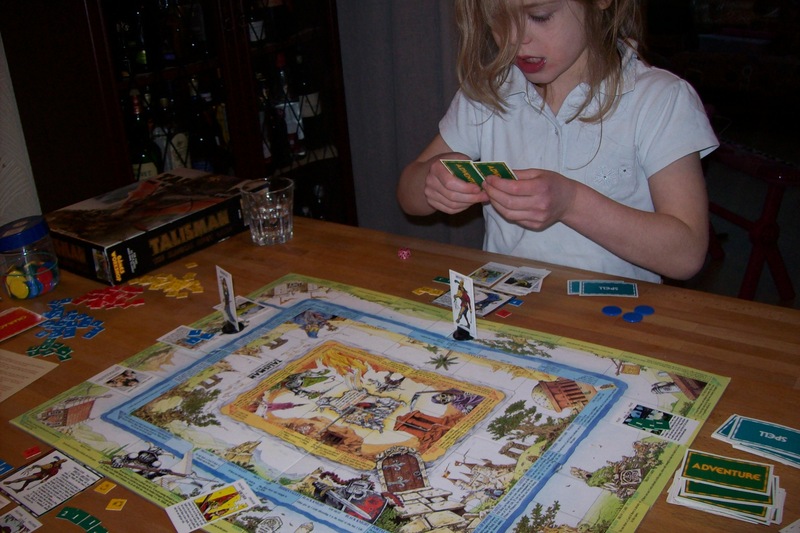 The game: Valley of the Four Winds (Games Workshop), 2 players aged 10+. This latest weekend was a good one for many reasons, but one of them was that I got to play a real classic of a game for the first time in years and remembered how much I enjoy playing it. Scotland Yard has been around for thirty years (though I was introduced to it in the early nineties) and is still pretty easily available, which is great. Basically, all but one player gets to work as a team of detectives hunting down the mysterious and evasive Mister X, played by the other member of the group. While the box says three to six players, I think this really needs five or six to really motor, and luckily there were five of us. Mister X was last sighted somewhere in Southwark. Is he making a break for the river? 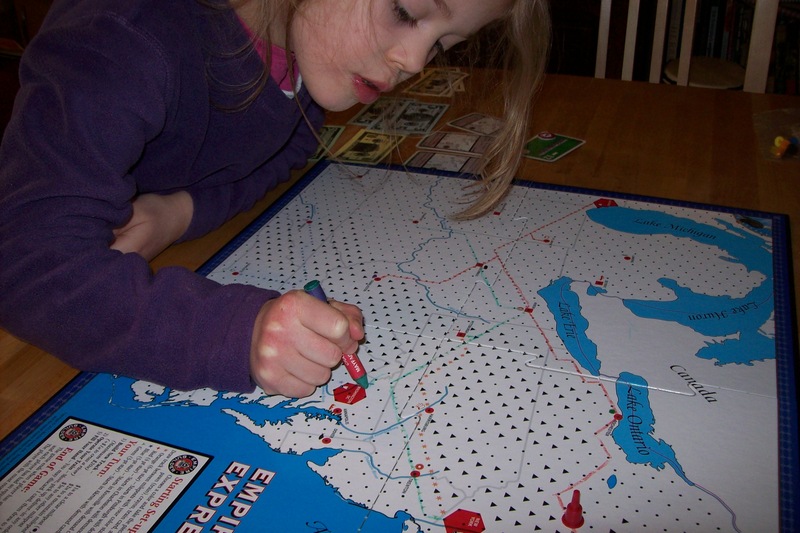 Back in the days of yore, we could never play this once as everyone wanted to be Mister X. Being part of the team is great, but the challenge of evading capture is so much fun that there could be big arguments over it. Luckily this time there was no fighting and everyone rolled their eyes, sighed and agreed to my somewhat enthusiastic request to be the villain. In the game, movement takes place using tickets for various forms of public transport (the police being without cars or bicycles for some reason) and Mister X uses hidden movement, but his location is revealed at various stages of the game. Miss B quickly got the hang of this and was soon chipping in to the team discussions as the detectives planned how to close the net on the villain. I noticed something similar when we played Flash Point in a large group a few weeks ago: Miss B gets quite involved in the planning and acts like she is really enjoying being part of the team. Given our recent discussion on cooperative games, I think Scotland Yard might be in a bit of a sweet spot, being a cooperative game but having a “real” adversary. It’s probably not worth over-thinking this, because we all had fun and, happily for me, Mister X escaped, albeit by the narrowest of margins. 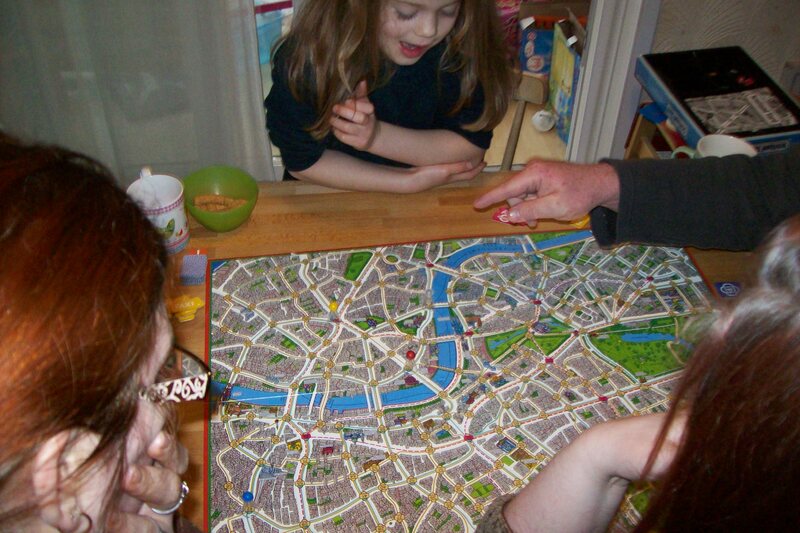 The game: Scotland Yard (Ravensburger), 3 to 6 players aged 10+. What was on the table in June?